ROHANI, AT THE AGE OF 80, is more muscular than most Americans have ever been in their lives. Though his back is bent, his body is corded with thick muscles — not the bulging bodybuilder type of muscles we’re used to on the Jersey Shore or California boardwalks, but the dense, wooden muscles that only come from real-life use. Rohani is a seafaring hunter of the Bajau people. The Bajau are often called “sea nomads,” as they earn their living entirely off of the bounty of the sea. The Bajau are spread out among the Philippine and Indonesian Archipelagos. The ones who live at sea are renowned as the world’s best free divers. The ones who live on land are renowned as equestrians. He eventually overcame his fear — his father taught him how to slowly, deliberately breathe, how to minimize effort underwater, and how to respect the “sea spirits.” “Practice wherever you find yourself,” his father told him. “Learn from what’s around you. Push too hard down there and you will die down there.” At 20, Rohani was allowed to hunt on his own, and was considered a man. 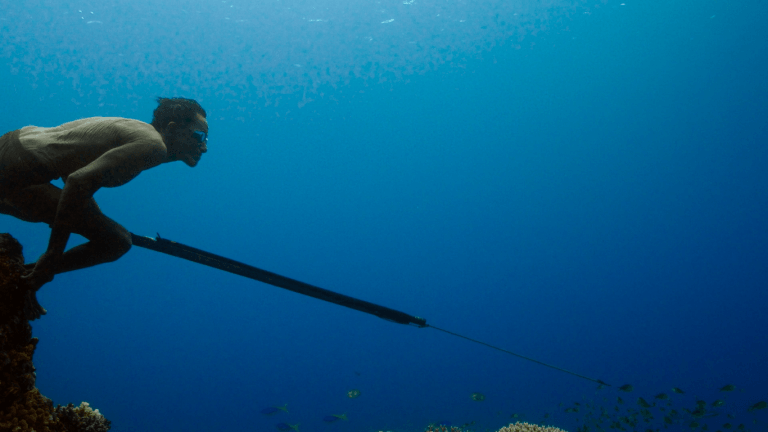 It quickly became clear that, even for the Bajau, Rohani was an incredible diver. As he pushed himself to stay under longer and to go deeper, he acquired a reputation. With the reputation came the name: “Jago.” Jago means master. Directors James Reed and James Morgan interviewed Rohani for their recent film, Jago: A Life Underwater. Rohani is an old man now — he does not have all of his teeth, his skin is weathered, and he does not have the strength or the breath that he used to. But he remembers the life he spent underwater, and he tells Reed and Morgan his story as modern Bajau re-enact the major events in his life. It’s a stunningly beautiful life — the towns that the Bajau live in are what we in the west would probably call shanty towns, but it doesn’t seem to matter to those who live there, as the towns are built directly over the water. The Bajau people have been known to spend upwards of 5 hours a day underwater without the aid of scuba gear. They hunt using spearguns, and can dive to incredible depths. Rohani, in that sense, is also a standout. He tells of rupturing his eardrums as he dove to a depth of 20 fathoms — which is 120 feet below the surface. Many Bajau rupture their eardrums intentionally to let them dive to these depths. As he gained some renown, he got married and had a family — two daughters and one son. But he wanted to explore. And he wanted to make money for his wife. His goal was to earn 1 million ruppiah, a small fortune back in those days. Today, a million Indonesian ruppiah equals about $76. He hopped from island to island to hunt. Eventually, he joined the crew of a Japanese trawler boat, which caught fish with nets and sent them back to Japan. The Japanese often hired Bajau, as they are known as excellent seamen. But while he was gone, his son grew up, and he started to dive without Rohani’s guidance and expertise. While out diving with Rohani’s brother one day, his son drowned. When Rohani heard, he “went mad,” and tried to kill himself with a dagger. He says of the sea spirits, “If we destroy the coral, they destroy us.” Most Bajau practice a religion that is a syncretic mix of Sunni Islam and ocean-based animism. Rohani remembers, as a boy, seeing a man walking along the bottom of the sea far beneath him. He was not a man — he was a sea spirit. Jago is a look into a totally different life, a totally different world, and is a reminder that there is no one right way to live. Rohani is proud of his life and his reputation, and it’s hard to watch the movie (shot in 4K) and not feel a little jealous of the things he has seen. “When I sleep at sea,” he says, “I dream only of an underwater world.” What a life, what a world. Jago: A Life Underwater can be watched on the Smithsonian Earth streaming service. 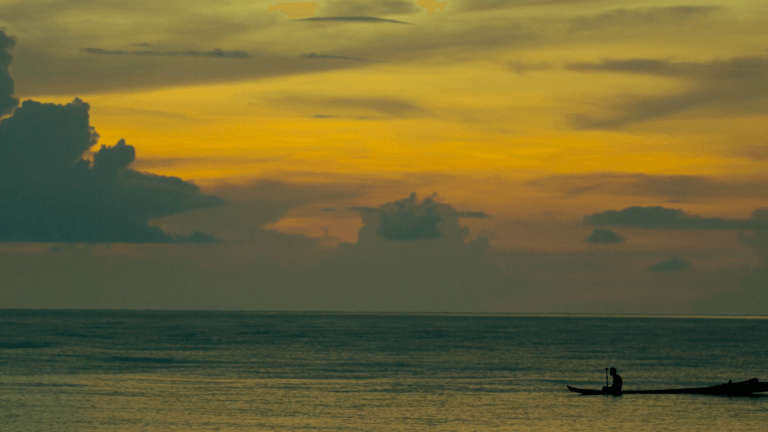 If you want to learn more about the Bajau, check out this photo essay on the “last of the sea nomads.” This article was originally published on the Matador Network.